Hove Station Neighbourhoods Forum has been created to write a Neighbourhood Plan and set up some Neighbourhood Projects. At the end of 2012, Brighton & Hove City Council published its draft City Plan. This included eight major development sites across the City and one was the DA6 area (see map overleaf). MATSIM have prepared schemes for the Conway Street area but have not yet submitted a planning application. Nationally, communities are being encouraged to get involved in preparing community-led plans to shape the future of their neighbourhoods and villages. After six months preparatory work, the Hove Station Neighbourhoods Forum held its inaugural meeting on 2nd July, where officers were elected and the first members were registered. A Neighbourhood Plan sets out the way a neighbourhood develops over the next 5 to 20 years. It’s written in consultation with the community. When it’s completed, everyone living and working in the area is able to vote in a referendum on whether the Neighbourhood Plan is adopted. If the Neighbourhood Plan is supported, it becomes the planning brief for the local area. 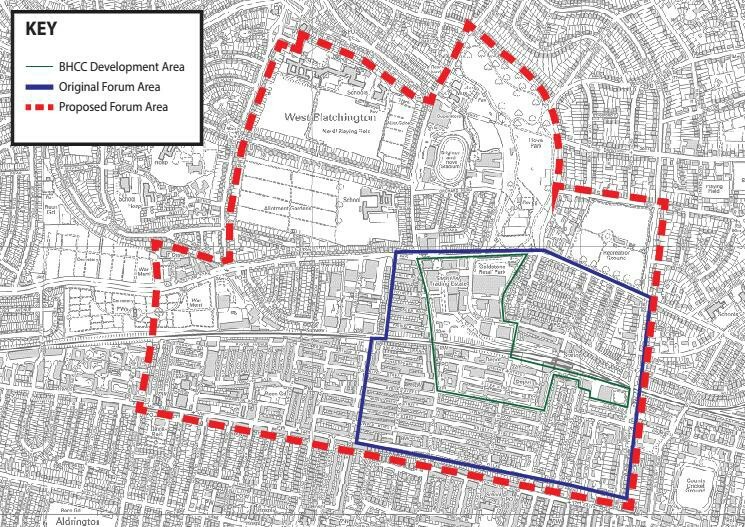 Neighbourhood Development Plan (NDP) which is to be taken into account when planning applications are being decided. NDPs are concerned with the use of land and buildings. Neighbourhood Plans take a year or more to put together. In the meantime we’re working on identifying projects that can deliver improvements to the area in the short term. Come and join us at our Have Your Say Day to find out more and share your views.